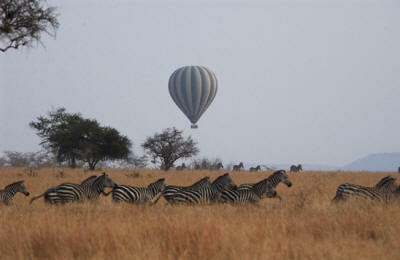 Truly Africa's most famous Game Reserve! The Serengeti National Park - Truly Africa's most famous Game Reserve! The Serengeti is Africa's most famous park. Renowned for the two million strong wildebeest 'Great Migration' and incredible concentrations of predators, the Serengeti is a park that guarantees an exceptional safari. The vast endless grass plains (Serenget in Maasai) are the richest grazing grounds on the continent; home to the largest herds on the planet, and the highest concentrations of predators in Africa. Just focusing on the Great Migration however would not be doing the park justice for it is widely believed that if you took the Great Migration out of the park, the Serengeti is still the finest park in Africa. Herewith a video by Singita Grumeti Reserve, about their lodges etc, but an absolute fantastic depiction of the Serengeti at the same time! Originally created to preserve the path of the Great Migration, the Serengeti and its surrounding reserves cover nearly 30,000 square kilometers. Throughout the year the huge wildebeest and zebra herds move in a clockwise direction around the plains, searching for fresh grazing grounds. To maximize your chance of viewing the herds, choosing the right accommodation, for the time of year you are travelling, is crucial. 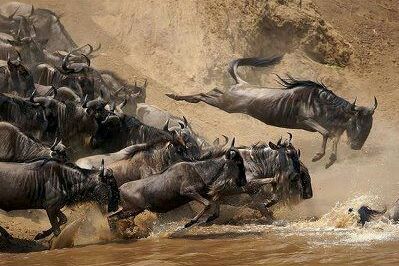 Have a read of the Wildebeest and Zebra Migration page to gain a clear understanding of the movement of the herds. The Serengeti has a huge range of accommodation, ranging from large hotels to small luxury lodges and no frills safari camps. The Serengeti is most famous however for its mobile camps - light weight safari camps that effectively move with the Migration herds. 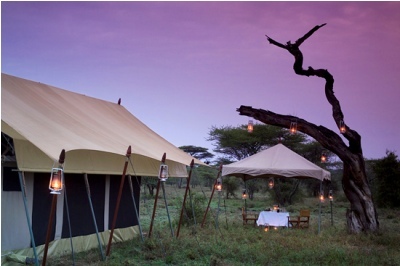 There are a number of these mobile camps operating in the Serengeti with our favorites being Alex Walker's Serian, Asilia's Olakira Camp, Lemala Ndutu, Sanctuary Kusini and finally the &Beyond Serengeti Under Canvas. If the idea of 'going mobile' is a little too adventurous then our favorite luxury lodges are Singita's Faru Faru, Sabora and Sasakwa, as well as Kleins Camp or Sayari Camp. The larger "hotels in the bush" are the best accommodations for those with young children. Vast herds, huge predator concentrations, uninterrupted views, river crossings, huge lion prides, great leopard sightings, high concentration of cheetah, some of the best camps in Africa! What more do you want!? 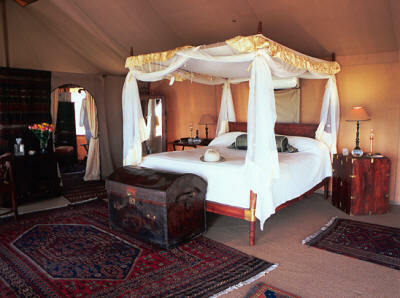 The Serengeti is one of those very rare places that receives so many accolades yet manages to live up to all the hype. Surrounded by amazing tribes, such as the Masai and Hadzabe, there is even more to this park than meets the eye. In a nutshell, the Serengeti is the mother of all safari parks and the most celebrated wildlife reserve in the world. It is like a lost world. In our view there is nowhere else like it. Absolutely outstanding! The Serengeti is one of the very few places in Africa of which you can say the game viewing is outstanding at any time of year. April and May sees the heaviest rains but even then, the lodges are ridiculously good value and the park is quiet. We believe the very best time of year to be in the park is either from January to March which includes the spectacle of the Great Migration calving, or alternatively from the middle of July all the way to the middle of November when the herds are crossing the Mara river to or from Kenya. There are so many different species in the Serengeti that this list could go on forever. The Serengeti's main attraction is the Great Migration, consisting of up to 2 million wildebeest, 200,000 zebras and 350,000 Thompson, impala and grant's gazelles. The predator viewing here is exceptional with approximately 3-4,000 lion and huge numbers of cheetah, leopard and hyena. Other game found in the park include topi, eland, hartebeest, buffalo, elephant, caracal, serval, bat-eared fox, hyrax, genet, hares, porcupine, aardvark, giraffe, jackal, mongoose, crocodile, monitor lizard, aardwolf, many kinds of primates including baboons, vervet and colobus monkeys, and over 500 species of bird. The main activity in the Serengeti is daytime game driving. No night safari is permitted inside the park but there are a number of lodges found in the reserves adjacent to the Serengeti which allow this activity. Most notable are Singita's Grumeti Reserves (Sasakwa, Faru Faru and Grumeti Reserves Sabora) as well as Klein's Camp and the camps in the adjacent Loliondo reserve are where guests can night drive. 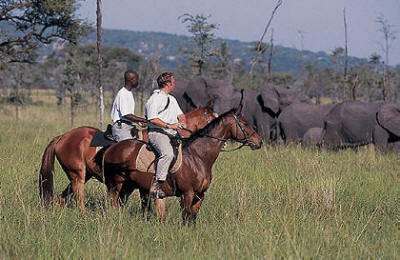 Grumeti Reserves also offers horseback safaris. Walking is also possible outside the park, and a couple of camps in the far North of the park allow for walks within the park boundaries. Speak to us for the most up to date information on walking inside the Serengeti as the rules change all the time! The Serengeti National Park is absolutely huge. If you are intent on viewing the Great Migration then where you stay is as much dependent on the time of year you are travelling as it is the style of camp or hotel you are looking for. Get the location wrong and this park is so big that you will not see the herds. The Serengeti is therefore broadly divided into four distinct areas - the central Seronera Valley, the Western Corridor, the Northern Lobo and Kogatende areas, and finally the Southern Plains. The Western Corridor follows the path of the Grumeti River up towards Lake Victoria. This region provides superb wildlife viewing action in May and June, when the migration crosses the crocodile infested waters of the Grumeti. 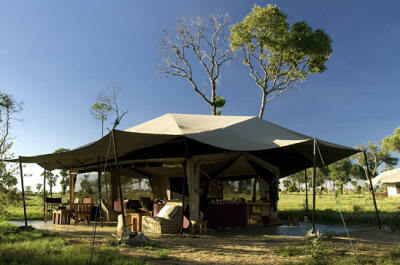 At this point camps such as &&&Beyond's Grumeti River Camp, Kirawira and Mbalageti come into their own. 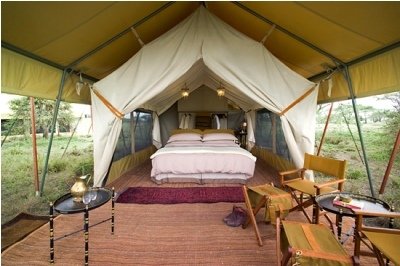 The two mobile camps that are superb at this time of year are the Serengeti Safari Camp and &Beyond Serengeti Under Canvas. The Northern reaches of the Serengeti remain fantastically quiet and unvisited, due to their relative inaccessibility (a good 10 hour drive from Seronera) and lack of large hotels. 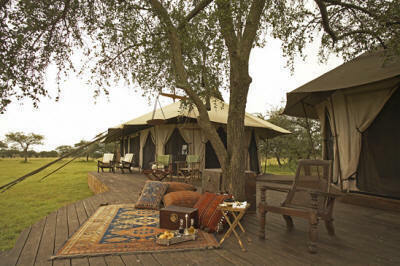 Previously inaccessible swathes of the Serengeti at Kogatende, close to the Masai Mara border, have been opened up over the last few years, either by extended driving safaris or with flying safari's to two superb permanent tented camps - Sayari Camp and Nomad Lamai. From July through to the end of October the Migration is resident in the area and is the finest place to see the Migration's river crossings; as the herds often cross the Mara River daily. This region has been described as 'ultimate paradise' for keen safari buffs and is the best place for walking safari inside the park. All the mobile camps move up for here for the whole period. The Serengeti's Southern plains are where the name of the park comes from. Huge endless grass plains stretch from Southern Seronera into the Ngorongoro Conservation area. The area is not as good for game out of the migration season as the central Seronera region, or the Western Corridor, but from December through to April the migration covers the entire area. February is a superb time of year to be here for the calving season when 8,000 wildebeest are born every day for a two week period! The only two permanent lodges here are Ndutu Lodge and Kusini Camp however all the mobile camps move down to the area for the whole period. We only actively support those safari camps and lodges that (to our knowledge) contribute directly to community upliftment and which apply good principles of sustainable eco-tourism. (Rural populations, across socio - economic lines, MUST be incorporated into the flow of benefits (both financial and otherwise) accruing from the tourism and wildlife industry).